Want to drive more search traffic to your SaaS? In this case study, we’ll step outside the usual content marketing tactics most SaaS companies use. And look at how Zapier leverages SEO to drive millions of high intent searchers to their product every month. This strategy has nothing to do with blogging (although we’ll take a look at how they added a blog later to enhance this approach). How they created 25,000 search optimized landing pages. How they filled these pages with unique content, without having to write it themselves. How they launch each page to generate a bunch of high quality backlinks right out of the gate. And how they use search marketing to create a more powerful network effect. Zapier is an app integration and automation platform that lets users (primarily SMBs) set-up triggered actions and workflows between different applications. They started in 2011 and have only raised $1.3M in venture funding, primarily bootstrapping their way to $35M ARR. Currently they have over 1,000 apps on their platform. 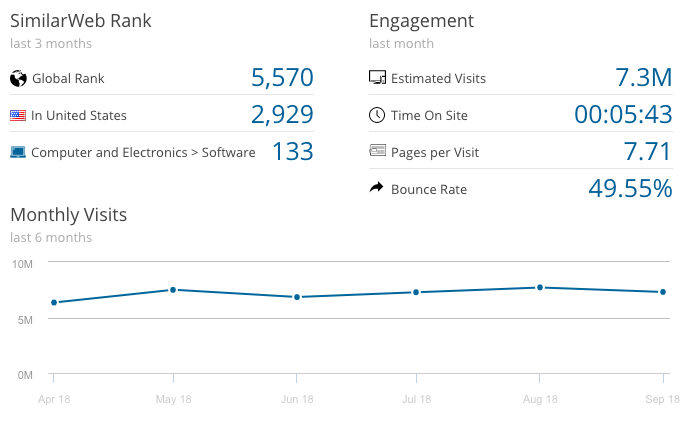 According to SimilarWeb, Zapier receives 7.3M visits a month. Of total traffic, over half comes from search. Like other middleware SaaS, Zapier faced the challenge of having an “invisible” product. Their app didn’t perform customer facing actions but instead formed connections behind the scenes to unlock new functionality and value from existing apps. Rather than trying to pitch users on the value of integrating tools, Zapier realized early on that people were already looking for specific integrations. To capture this existing intent, Zapier decided to make the app partners in their integration ecosystem the stars of their marketing and piggyback on their success. A landing page for the app itself. A separate landing page for every app to app integration e.g. 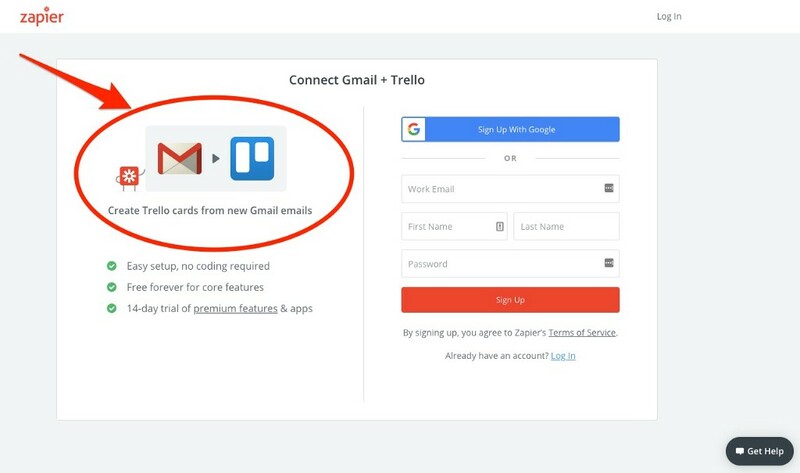 a page all about connecting Gmail with Trello. Separate landing pages for every single app to app triggered workflow or “zap” that exists between each app. Whether someone is looking for general info on an app, how to integrate two apps together, or a specific app to app use case or scenario Zapier has a landing page ready to capture that intent. That makes for a lot of landing pages. According to data from SEMRush, there are over 25,000 of these landing pages ranking in the top 100 of Google. These landing pages were the main driver of Zapier’s early growth, and today they account for approximately half of all search traffic to the site based on SEMRush estimates. Creating 25k landing pages is one of those things that sounds crazy without some hack or workaround. But Zapier’s “hacks” look a lot more like persistent effort combined with smart systems thinking and a solid understanding of SEO. One of the things you might be tempted to hack with landing pages at this scale would be using some kind of repeatable content template, since the content creation side would be the most time intensive. Just change a few keywords for each app and voila, right? But Zapier recognized the SEO value of each page having unique, relevant content. While their pages do have a templated structure and layout, each page also has human created descriptions of the apps and summaries of each integration. And we’re not just talking about a few lines of unique text, many of the pages have multi-paragraph overviews that drill into deeper features and benefits. But rather than write all this content themselves, Zapier created a playbook for onboarding and launching new app partners. Part of this onboarding process includes getting app partners to write the content for these landing pages. If needed, it also includes editorial guidelines for the Zapier team to clean up the content to make it a perfect fit for each landing page. Not only does this free up one of the most time intensive SEO elements, but it also generates the most relevant content from the people who have the best understanding of each app’s use cases — the app creators themselves. Getting partners to set-up an integrations page on their site linking back to Zapier. Getting partners to write a post announcing the integrations on their blog. Adding links to a few of the top “zaps” directly in the partner’s app. Not only do these partner promotion tactics generate a stream of new users for Zapier, but they also provide an initial set of backlinks to help boost the page rankings. Then there’s the initial exposure that may get the integrations written about on industry blogs, or shared on social media. Garnering more backlinks. Middleware SaaS platforms like Zapier are one of the most obvious examples of network effects in SaaS. As Zapier adds new app partners to its integrations list, its platform becomes more attractive and valuable for end users. And the more end users attracted to the platform, the more apps want to join the platform. It’s a virtuous cycle. Zapier’s SEO strategy plugs into this network effect seamlessly and amplifies its impact. Each new app partner leads to a new set of app landing pages, expanding Zapier’s ability to capture high intent searchers. The more new users Zapier generates from this search traffic, the more enticing the platform becomes to new app partners. Which leads to more app landing pages. Another virtuous cycle. These landing pages also have a protective effect on Zapier’s expanding network, essentially surrounding it with a moat that competitors will have a hard time crossing. Building 25,000 unique landing pages isn’t something that’s easy to duplicate. And it would add an extra layer of difficulty for a competitor entering the same space. This is in contrast to acquisition channels like paid search and paid advertising, which allow you to quickly expand your reach to a large audience but aren’t ideal for protecting your network long term due to the high cost of sustaining paid acquisition. Zapier also appears to be leveraging its network of app partners and landing pages to gain a foothold in the app discovery market, going up against players like G2crowd and Getapp for many of the same search terms. Zapier’s app landing pages offer an overview of each app’s key features, pricing information, and a list of potential alternatives. All things that would be highly relevant to someone researching new apps to add to their stack. All of these details are laid out in a very straightforward, easy to understand way (details you often have to sift through a lot of fluff to find on leading software review sites). First, its business model makes it less biased than many of the leading software review and app discovery platforms. In many cases, these platforms make money by offering app companies marketing services built on top of their platforms. While these services might not overtly manipulate reviews or push users toward a specific app (in many cases they sell buyer intent and analytics data), the UX they are ultimately designing is still biased toward driving revenue from their marketing services. That might not always be aligned with making it easy for end users to find the best software solutions. Zapier could create a much more clean, honest way for users to parse through all the noise and find software that matches their needs. Second, Zapier has the best data available on how apps integrate with each other and the unique solutions these integrations can provide. As the SaaS market continues to balloon in size and niche solutions continue to create more fragmentation, having a clear view of how each app ties into the overall stack becomes more important for users. Zapier could help users get a clearer picture of what their overall stack should look like, and how they can accomplish their goals through unique integrations that no single software can provide on its own. And finally, Zapier already has the SEO acquisition channel in place to begin mining the app discovery market for new growth. They already rank well for many of the search terms people are using to research new apps, and they have a proven playbook for rapidly expanding their app network and search rankings. It will be exciting to see how they continue to tap this opportunity going forward. Zapier’s network of app and integration landing pages work great at drawing in visitors searching for a specific app or integration. However, there are also a lot of people searching for more general app categories and use cases that these landing pages don’t rank as well for. These searchers haven’t yet narrowed their search down to a specific app, and are performing mid funnel research on apps available in a specific category. Or they’re doing top of funnel research on solutions to a specific problem or use case, and may not even be aware that an app is a good way to solve their problem. 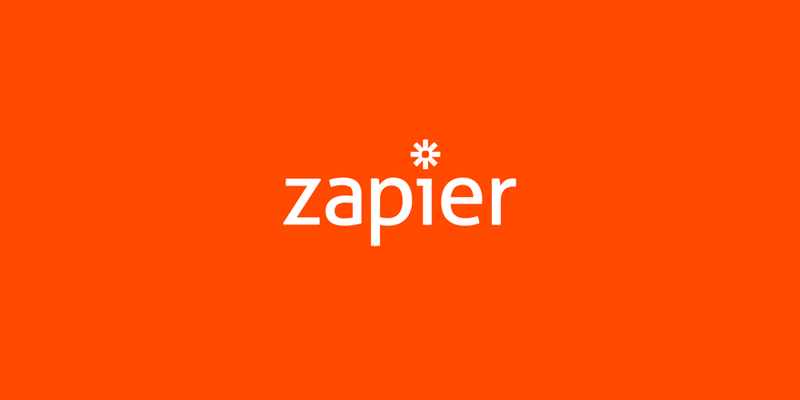 In order to connect with these searchers, Zapier created a blog and content marketing strategy that focuses on exploring different app use cases and reviewing apps in different categories. By not waiting until a need for a specific integration arises and exposing users to Zapier’s integrations early in the customer journey, Zapier is able to cast a wider net and generate new demand for its service. And it has widened their search net significantly. 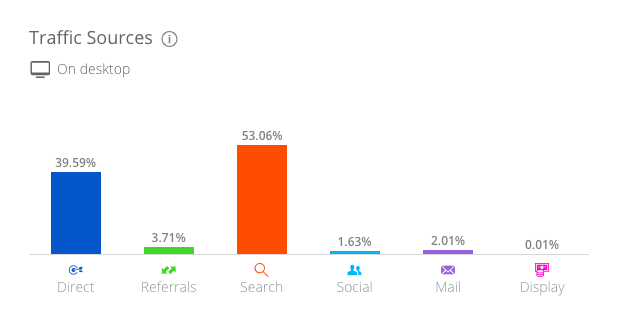 According to SEMRush, over 1/3 of Zapier’s search traffic comes from their blog. As we discussed earlier, this also positions Zapier’s integrations as a key consideration when choosing an app and building a software stack — rather than an afterthought that comes when you are trying to fill gaps in your existing stack. All Zapier’s search traffic isn’t worth much if they can’t convert some of those visitors into users. To help maximize conversions, they use highly relevant calls to action on both their app landing pages and in their blog posts. Zapier assures visitors they are on the right track when they reach the sign up page, with copy customized to fit the specific integration they clicked to set-up in the CTA. This simple customization nurtures the visitor intent that was established on the landing page or blog post. After creating login credentials, Zapier doesn’t waste that user intent by dropping new users into a central dashboard or control panel. Instead, users are dropped right into the integration set-up flow where they can get the integration from the CTA up and running. This is a critical step in the Zapier user journey. If a user can get their first integration set-up, they can experience the “magic moment” of seeing it automate away a manual task that they’re used to spending their time on. The value of that time savings suddenly becomes tangible. While cutting out any unnecessary steps and dropping new users straight into this integration set-up flow makes a lot of sense, it also poses a challenge. Setting up an integration involves a lot of steps by itself. Zaps I created involved around 10 steps to set-up, and some of the steps can be moderately technical. Users may get confused along the way or drop off before they reach that magic moment. 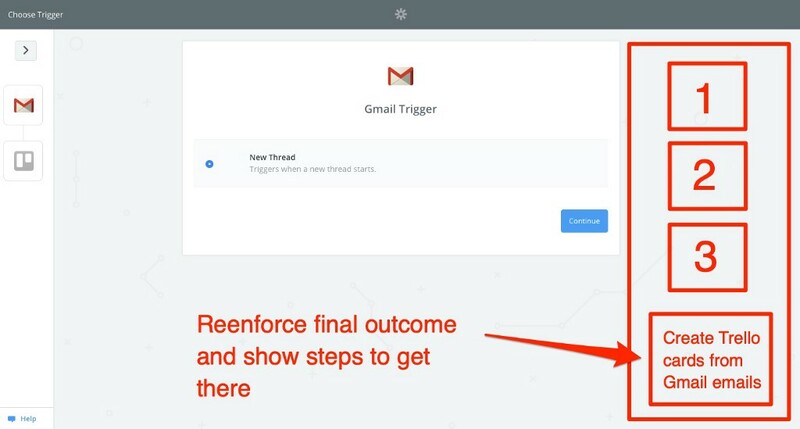 One thing Zapier could test to increase completion rates of this set-up flow is adding some kind of onboarding tool to guide users through the process. This could be as simple as giving a high level overview of the steps involved, and highlighting the desired outcome waiting for them at the end of the process. Ultimately, Zapier has done an excellent job crafting high quality landing pages and content that both Google and visitors like. And they’ve created a playbook and systems that have allowed them to scale this high quality approach. But maybe the most strategic and admirable SEO decision they made was to embrace the “invisible” nature of their product, and put their app partners and users first. They have put app partners in the spotlight while fueling their own growth. And have built a simple, direct way for users to find the integrations they need to save time and maximize the value from their stack. Need help architecting an SEO strategy for your SaaS? Trying to come up with a plan to get better results from your search marketing? Click here to learn about working with me. Originally published at ryanberg.co on November 7, 2018. How Zapier Reached $35M ARR With This SaaS SEO Strategy was originally published in Marketing And Growth Hacking on Medium, where people are continuing the conversation by highlighting and responding to this story.